[Image: nLdVV0b.jpg]MUMBAI: A new season of ‘Sarabhai vs Sarabhai’ will premiere on Star India’s digital platform Hotstar on 16 May. Vivo will be the presenting sponsor of the show and Vodafone the co-powered sponsor. Producer JD Majethia of Hats Off Production has taken an innovative approach to market and promote the series. The first promo of the show encourages fans to suggest a title for the season. In the second promo, the new title of the show is unveiled as ‘Sarabhai vs Sarabhai Take 2’ and the producers give a shout-out to the fan who has suggested the title. The tag line of the show is ‘Clean Comedy’. Several interactive activities are taking place on social media platforms, where the stars and producer of the show are actively engaging with fans and keeping them updated with the series progress. The new season will be a finite series showcasing a seven-year leap from the last season. Apart from the original cast featuring Ratna Pathak Shah (Maya), Satish Shah (Indravadan), Rupali Ganguly (Manisha), Sumeet Raghavan (Sahil) and Rajesh Kumar (Roshesh), the show will introduce some new characters. ‘Sarabhai vs Sarabhai Take 2’ will be part of Star India’s Hotstar Originals. To date, Hotstar Originals have showcased five original shows—a stand-up comedy show ‘On Air With AIB’, romantic drama titled ‘Tanhaiyan, Cineplay’, Hindi talk show ‘Bol Viru Bol’ and the Vivo IPL special show ‘The Fanatics’. 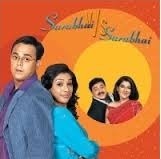 ‘Sarabhai vs Sarabhai’ originally aired on Star One from 2004 to 2006 and ran for nearly 70 episodes. The story revolves around the life of an upper-class Gujarati family, the Sarabhais, who live in a luxury apartment building in the upmarket Cuffe Parade area of South Mumbai. Much of the humour is derived from Maya and Manisha’s different backgrounds. It takes a dig at the artificial and shallow interactions among the city’s elite and their perceived notions about the shortcomings and failings of middle-class society. Current time: 04-22-2019, 11:45 PM Powered By MyBB, © 2002-2019 MyBB Group.